The winter Olympics are in full swing, which means there is no time to cook. No point in trying, really. We’ve got the whole shebang — figure skating, cross-country skiing (my new favorite), snowboarding, you name it — filling up our DVR, waiting for us every night. There will be time to labor over the stove later. For now, I must support the team. Never mind that I watch each competition a day behind and have had to, therefore, read my newspapers a day later. It feels like I’m cheering them on. So, between our commitment as national cheerleaders and the never-ending winter (The Post is predicting “5 to 14 inches” of more white stuff for the DC region in the next couple of days), a sturdy, cooks-itself standby is in order for the week — A Pot Roast. Pot roast was one of three favorites I remember from Sunday dinners at Grandma’s, along with goulash and “garbage soup.” The roast has become an increasingly popular dish at our house since we received a Romertopf clay baker for Christmas. 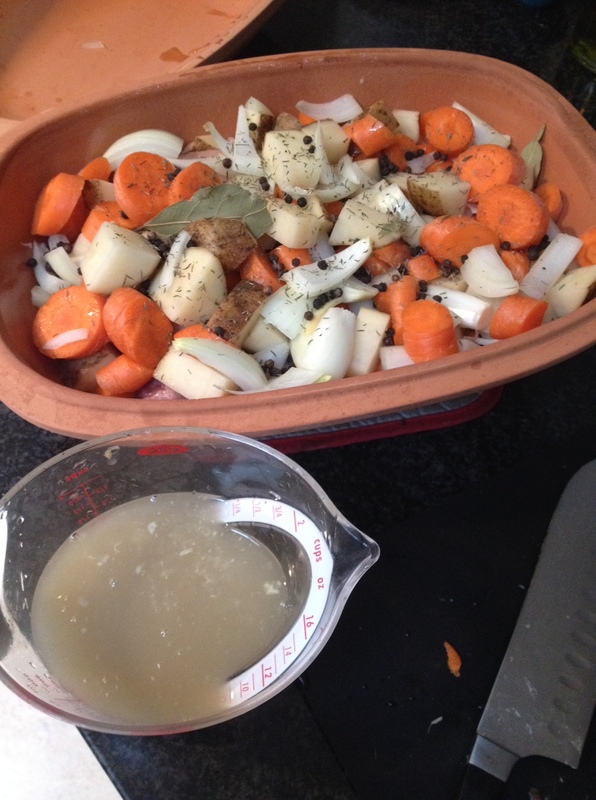 Pot roast just looks more roast-y coming out of a baker or dutch oven than it does a crockpot. You can present it on the dinner table as a sort of centerpiece (though I recommend slicing it on a cutting board to prevent splattering your table). You can go decadent with a pot roast. We got hooked on a recipe that called for orange juice and maple syrup for a while, but it was quite the calorie contender. My standby recipe these days is the ever-so-simple version. The one that helps use up a half bottle of decent red wine that’s on the edge, along with whatever wintry vegetables are languishing in the fridge. These directions are for a clay pot, like the Romertopf. 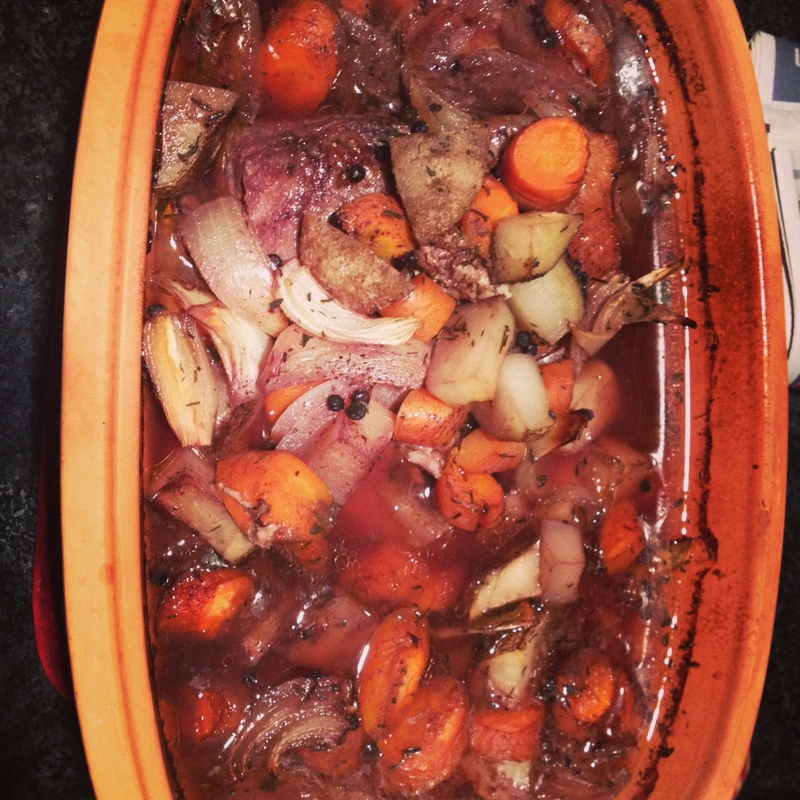 Find great directions for cooking the same dish in a dutch oven, pot on a stove or crockpot. With a clay pot, you don’t preheat the oven. Place the filled pot into a cold oven and allow them to warm together. Cut small slits into the sides of your beef cut and insert the slivers of garlic. Place the celery, onion and bay leaf in the bottom of the pot, then the beef on top. Surround the meat with carrots and potatoes and sprinkle the dried spices, salt and pepper on top. Pour the beef broth and red wine over top, careful not to overfill. You can reduce the liquid if it nears the top, depending on how big your vegetable chunks are. Place lid on top of baker and carefully place it on the center rack of your cold oven. Heat the oven to 400°F and cook for one hour. Pull rack from oven and test the meat with a fine skewer. It should enter easily. Cook longer and up to one additional hour if necessary. You want to cook the meat until tender, but the doneness is up to your preference. Some prefer it to be crumbling apart, while others find themselves too hungry to wait. You can make a thicker sauce out of the drippings by reducing them in a saucepan and whisking in a thickener such as cornstarch or arrowroot powder, gently simmering. We are usually too hungry and enjoy the meat and vegetables in the broth-like drippings. Add crusty bread and butter on the side for the full Sunday dinner experience. Enjoy these wintry days and, of course, the winter Olympics.